Dr. Jitendra Sharma is Professor of Operations Management and teaches an elective course in quality management systems along with six sigma. His research involves using QFD to address quality and customer centric issues in product development. He also teaches operations management and lean systems. He has more than 30 international peer reviewed journal publications to his credit. 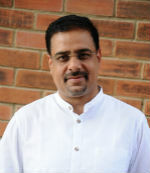 Professor Sharma has also authored numerous cases on the topics of operations and process management, including topics such as inventory management, MRP, AHP, forecasting, process planning and control, process and capacity management, six sigma, SQC, target costing, value analysis, sales and operations planning, etc. These cases are hosted with Harvard Business Publishing, Ivey Cases, Emerald and The Case Centre. Some of his best selling cases have been translated in Spanish and Chinese. Professor Sharma does lean, six sigma, process and operations management training for executives of companies like Asian Paints. He holds a Ph.D. in Mechanical Engineering from the NIT, Raipur He also holds an M.Tech. from Nagpur University, MBA in Operations from IGNOU and a B. Engineering in Production from Nagpur University. Before diving into the world of academics he worked with different manufacturing industries as an engineer. He has a work experience of 27 years, of which 5 years were in industry and remaining in academics. Ph. D. (Mech. Engg. ), in 2007 from NIT, Raipur. M. Tech. (Mech. Engg. ), in 2002 from Nagpur University. M.B.A. (Operations), in 2000 from IGNOU, New Delhi. B. E. (Prod. Engg. ), in 1990 from Nagpur University. Senior Lecturer - Production & Mech. Engg., Manoharbhai Patel Institute of Engineering & Technology, Gondia (12 years). Visiting Faculty (for MBA) - Dept. of Management, N. M. D. College, Gondia. Technical Officer - Shetkari Solvent Limited, Hinganghat (1 year). Quality Function Deployment; Product Development and Operations related areas. Ranking Customers Requirements in QFD by Factoring-in their Interrelationship Values, The Quality Management Journal, ASQ, Vol. 14 (3) 2007, pp 53-60. Linking Company with Customers & Competitors: A Comprehensive QFD Model & its Post Matrix Analysis, International Journal of Simulation & Modelling, ACTA PRESS, Canada, Vol. 29(2), 2009.